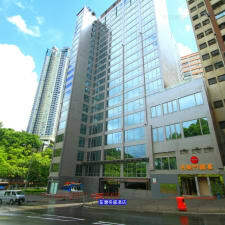 The four-star Dorsett Tsuen Wan is a five-minute walk from Tai Wo Hau subway station. The hotel also provides guests with a free local shuttle that stops at nearby points of interest and operates throughout the day. Complimentary Wi-Fi can be found in each accommodation. Rooms are also equipped with a minibar, a flat-screen TV, coffee and tea making facilities and an in-room safe. There is a full service spa at Dorsett Tsuen Wan as well as a swimming pool and a fitness centre. The hotel also provides a free smartphone with unlimited data and local and international calling to guests. Dorsett Café is the property’s on-site restaurant and offers all-day dining. The eatery also has a bar area. Hong Kong International Airport and Disneyland Asia are a 30-minute drive from the property. The Luk Yeung Galleria can be reached in five-minutes by car. Travellers say the mattresses at the hotel are excellent and make it easy for you to get some rest. Not only are the beds soft, but guests add that the bedding and pillows are good as well. There is a complimentary local shuttle offered at the hotel that stops at a nearby subway station and a couple of other places. The service operates seven days a week from morning until night. Guests explain this is good to have as the nearest subway station is a bit far away, especially if it is raining or hot outside. The property provides you with a mobile phone that has unlimited data and free local and long distance calling on a complimentary basis. Visitors say this service is quite nice to have and provides a great deal of convenience. The employees at the hotel are not exactly eager to go out of their way to assist you according to several visitors who add that your requests might be ignored or dismissed on occasion. In addition to this, several staff members are not all that friendly or pleasant to interact with. A few travellers note that the size of the accommodations is pretty tiny and doesn't offer much in the way of extra space should you wish to stretch out. The hotel is situated in the Tsuen Wan district of Hong Kong which is more than a 20-minute drive or subway ride from the central business district. Some visitors complain that the property is bit too far away from the city centre if you need to travel there often during your stay.